Personalized, Customized, Individualized: What’s in a name? The field of education is abuzz with terminology surrounding the concept of Personalized Learning. At the recent iNACOL Symposium titled “Personalizing Learning: Equity, Access, Quality”, I became acutely aware of how this term is dominating the national scene. Educational publications, events and vendors are trying to sort out the new nomenclature — what does this mean for the field? In recent years, Technology & Innovation in Education (TIE) has become heavily invested in the concept of Mass Customized Learning as proposed in the vision detailed in the book Inevitable by authors Chuck Schwahn and Bea McGarvey. As evidence of this commitment, TIE applied for and received a $4 million grant from the Bush Foundation based in Minneapolis, MN. This funding is being leveraged to assist a group of South Dakota schools to make transformative changes to drastically improve the learning and teaching experience. The foundation is lending support to TIE and other agencies because they are interested in growing the concept of Individualized Learning. While the Bush Foundation prefers the term individualized learning and a number of organizations are using the term personalized, at TIE we tend to gravitate toward the term customized learning. Recently I’ve been trying to work through this varied vocabulary to determine if we are all saying the same thing or if these are unique efforts. Initially my perception was that people touting the need for personalization were not attending to the immense need to change outdated Industrial-Based structures, which is a tenet of customization. Now I’m not so sure. I think some are attending to this need and I think others are substituting technology for good instruction and calling it personalization. Although vocabulary is important, it plays a role in helping everyone build shared understanding; I honestly wouldn’t care if we call it “Purple Learning” if it meets the goal of drastically improving the learning and teaching experience. So what is necessary to achieve this goal? Based on my current understanding and experiences, in my humble opinion, these are the key constructs: a truly learner-centered experience, a mastery-based learner experience built on relevant learning targets, and drastic alterations and transformation of the current Industrial-Based structures of school as we know it. I believe a truly learner-centered experience is created when we meet learners at their achievement level, all day long, every day; when we pair the learning with relevant content of interest that is also culturally responsive; and, when we accommodate learning style needs as often as possible. When we can do those things, we support a more intrinsically motivated learning environment where individuals can flourish and reach their full potential. For too long we have relied on “sticks and carrots” to compel students to learn. This can work temporarily for some students, but more often it leaves them feeling disconnected and anxious to escape school and everything associated with learning. During a recent visit to the Lindsay Unified School District to experience their performance-based system, I doodled a representation of a graphic presented in their visitor materials in my Rocketbook. We want students to be in the “learning zone” often. This is the sweet spot, the Goldilocks scenario where learning is not too hard and not too easy, it is just right. 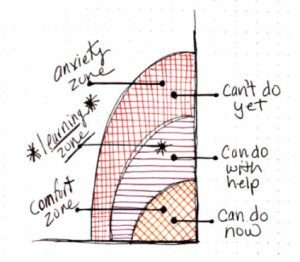 Scholarly types call this the zone of proximal development ala Lev Vygotsky. The second construct, mastery-based learning, plays a vital role in helping students live in the learning zone more often. A transparent system of relevant learning progressions helps the learner have clear direction and continuous formative feedback about where they are currently and what they need to do to reach mastery and move forward. A side benefit of a mastery-based approach is that learners have very little downtime, they aren’t waiting for the teacher to tell them what to do next. This lack of downtime results in decreased discipline and behavior issues. It should be noted the term mastery-based learning can also be debated in place of competency-based and performance-based. As of yet, I’ve found no significant difference among the terminology except preference, but I’m always learning and open to new information that shapes my opinion. The final construct, drastic alteration and transformation of antiquated Industrial-Based structures, is for me the big differentiator when we are debating the merits of terminology related to personalization, customization and individualization. If you are not changing the structures then your work likely won’t “stick” for the long term. The massive system and structures that compose the institution of School, cause innovations to rebound and be reframed by traditional constructs which results in a loss of effectiveness and impact. If we don’t truly impact the system with our effort, then we are just tinkering, which ultimately means we continue to do things the same way we have always done them — maybe with a little more shine and polish, but at the heart of it all we haven’t significantly changed pedagogy and practices to improve the learning and teaching experience. Changing structures is heavy lifting and not for the faint of heart. There will be resistance, it will be uncomfortable, things will get messy and complicated before they get better, it will not happen overnight, there is no software or technology product that does it for you. Additionally, there is no step-by-step guide or plan that will meet the needs of all schools. Fortunately, there are many entry points and possibilities and we do have an understanding of the structures that need to be tackled and a clear vision of the structures needed to replace them. There can certainly be variations in vocabulary across organizations, but this list offered by TIE is a start for building shared understanding and identifying the path for transformation. One of the traditional structures addressed in this list is Grade Levels/Classrooms. For administrative convenience, we group students by their age so that we can move them along the Industrial-Based System of schooling. Batch processing made sense when we had limited resources to address individual learning needs. We no longer live in the days of Laura Ingalls Wilder, one human teacher, one primer, one slate and chalk. We do have the human resources and technology resources to meet a spectrum of learner needs. To better understand the constraints of grade-level grouping, TIE produced this video to create shared understanding of why change is needed. Grade level grouping is just one of the weight-bearing walls that support the traditional structure of school. Although transformative change is difficult, it is imperative to start somewhere. The future of our children, our nation and our world depend on it. It does not work well to integrate new practices in an old system — we must change the system to support practices that allow us to create a truly learner-centered community where individuals can feel supported, successful and where they can realize their full potential.